Supreme Court Rejects BP's Challenge To Gulf Oil Spill Settlement : The Two-Way The oil giant had hoped to limit how much it will pay under a 2012 settlement with people and businesses on the Gulf Coast. 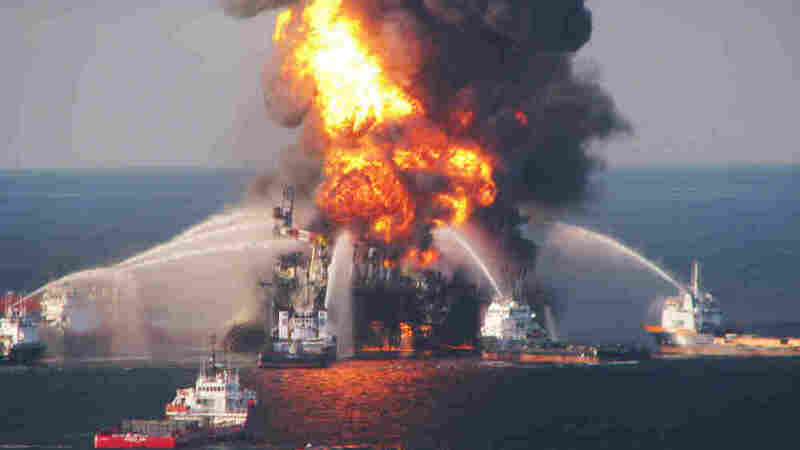 BP originally estimated it would pay $7.8 billion to settle claims. Oil giant BP has suffered a legal setback in its effort to limit how much the company will pay under a 2012 settlement with thousands of individuals and businesses along the Gulf Coast. Without comment, the U.S. Supreme Court rejected BP's request that it review previous lower court decisions that favored plaintiffs. BP said the lower courts allowed people who were never hurt by the 2010 spill to file claims. But critics said BP was just trying to rewrite the settlement terms and limit its liability. Plaintiffs attorneys Stephen J. Herman and James P. Roy said in a statement, "Today's ruling is a huge victory for the Gulf, and should finally put to rest BP's two-year attack on its own settlement. With its order, the Supreme Court held — as had the lower courts — that BP must stand by its word and honor its contract." BP spokesman Geoff Morrell says the company is still concerned that awards are being made "to claimants that suffered no injury from the spill and that the lawyers for these claimants have unjustly profited as a result." "On behalf of all our stakeholders," says Morrell, "we will therefore continue to advocate for the investigation of suspicious or implausible claims and to fight fraud where it is uncovered. In doing so, we hope to prevent further exploitation of our commitment to compensating all those legitimately harmed by the spill." Originally, BP estimated it would pay $7.8 billion to settle claims under the agreement. But now the company says it doesn't know how much the agreement will cost. If you recall, the company also is facing up to $18 billion in federal fines under the Clean Water Act after a federal judge ruled that BP's "gross negligence" and "willful misconduct" were to blame for 2010's massive Deepwater Horizon accident and oil spill in the Gulf. As we've reported, New Orleans federal Judge Carl Barbier issued the ruling in September. A month later, BP asked him to reconsider. And a month after that, the judge said no.